Your child is the most important “cargo” in your vehicle at all times. For this reason, you will need a high-quality car seat to keep your infant safe at all times. An infant car seat is a necessary tool right from the hospital until he or she is ready for the seat belt. Among the most important criteria to filter a good car seat before purchase include the ease of use, and how well you can shift between different vehicles. While most of us might be tempted to spend more cash in order to get the best quality, this is not always true. Whatever the cost, a seat may simply be incompatible with your car. What’s more, many inexpensive to mid-priced models work better than the expensive ones. Thankfully, brands like Graco makes car seats of unparalleled quality. Such seats surpass federal safety standards and are incredibly affordable. The Graco seat you need however, will depend on nitty-gritty factors such as your child’s age and the LATCH features you need. Also, whether you want one seat that allows your baby to grow from infant to toddler. With this in-depth shopping guide prepared for you, you’ll be sure to walk out with an appropriate infant car seat. Coming in at 7.5 lbs. 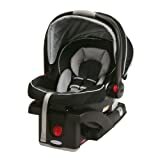 (without the base) the Connect 35 Infant Car Seat is a lightweight alternative that makes it easy for moms to ferry their babies from the stroller to the car and anywhere in between. The Connect 35 is tailored to safeguard babies who are rear facing weighing in between 4 and 35 lbs. and includes features that are geared to making your little one safe and comfortable. The Graco SnugRide Click Connect 35 Infant Car Seat is fitted with the Click Connect technology. The Click Connect mechanism makes the car set more user-friendly by providing a single-step attachment to Graco strollers. This car seat very much fits the profile of a first car seat to protect your infant. 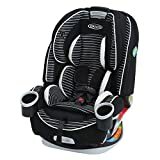 While other car seats may not fit into your car first time, the Connect 35 Infant Car Seat is equipped with an adjustable base with six recliner positions. These allow you to customize it in accordance with your vehicle’s space. Graco has simplified the mounting process thanks to the easy to read level that eliminates all the guesswork during installation. Despite its lightweight design, the Connect 35 manages to exceed all US safety standards. It also features EPS absorbing foam for effective energy management during impact. The 4Ever 4-in-1 Convertible Car Seat like its name suggests is a fully 4-in-1 convertible infant car seat that can stay with you for an eternity. 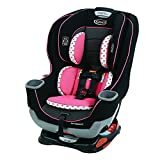 The infant seat is comfortable both as a rear facing or as a front-facing 5-point harness car seat making it a convenient choice for transitioning as your child grows. As a rear-facing car seat, the seat’s weight capacity falls between 4 and 40 lbs. and between 22 and 65 lbs. for front facing children. This is the one true seat allows your baby to grow from infant to booster without changing car seats. The 4Ever 4-in-1 Graco car seat should be a very comfortable seat for your child. It features their very own Safe Adjust Harness System that allows easy adjustment of the headrest and harness. The 10-position harness allows this to be done with a more precise fit. The installation is just as you’d expect from Graco Car Seats, simple and easy. The LATCH system and a second attachment help to reduce installation times while the six position recline helps you find the most comfortable position for your kid. Just like all Graco car seats, this one surpasses federal tests and also manages to include a nifty cup holder to keep the child’s drinks close. Endorsed by the American Academy of Pediatrics, the Extend2Fit Convertible Car Seat, like all other rear-facing car seats should be used until your kid is 2 years. The Extend2Fit is fitted with a 4-position extension panel that adds a much-needed leg room for your child to ride for longer without getting fatigued. When used in a rear-facing fashion, the Extend2Fit can accommodate between 4-50 lbs. and 22-65 lbs. when forward facing. Like all top seats from Graco, this one features a Simple Safe Adjust which allows you to adjust the height of the seat as the kid grows. The Extend2Fit puts convenience as its top priority. The InRight LATCH coupled with the second LATCH attachment; hold the belt buckle out of the way for easy entry and exit of the baby. Again, the installation is hassle-free thanks to the included level indicator. The Tranzitions booster seat from Graco is designed to grow with your child. This car seat should be enough to hold your child right from infancy to a toddler. The Simple Safe Adjust Harness System is also featured in this model. 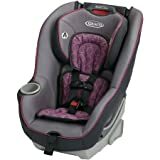 The height of the harness and the child headrest should be easily adjustable for up to 10 positions. In addition to this, the Tranzitions 3-in-1 car seat is also equipped with a harness storage compartment that allows the harness to stay close to the seat even after transforming to highback booster mode. This car seat also features a clever dual cup feature to hold the child and the mother’s drink. Machine washable covers, seat pad help in maintaining a clean car seat for safety and well-being of your baby. Filled with unique features, the open loop belt serves to help you correctly position your vehicle’s seat belt. The Graco Tranzitions car seat has undergone and passed all safety requirements including the Side Impact Test and rigorous crash tests required by the United States. The Graco Contender 65 Convertible Car Seat is capable of holding a rear-facing infant of weight between five and 40 lbs., and a forward facing toddler whose weight is between 20 to 65 lbs. With the simple safe adjust feature, the Contender 65 is capable of growing with your child as it can automatically adjust the harness and the headrest height. The user-friendliness of this car seat makes it one of the favorites for many moms. The included LATCH and readable level indicators offer a quick and easy installation. The Contender 65 is a comfortable seat for both you and your child. The movable head and body support ensure that you kid assumes the best position while in transit and the two buckle positions ensure that your kid fits snugly and securely. The seat pad is machine-washable making it easier for you to clean and replace it as soon as it picks up some dirt. 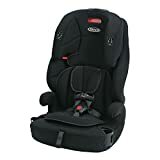 For safety standards, you will be happy to learn that the Graco Contender 65 Convertible Car Seat is Safe Seat Engineered, which generally includes Side Impact Testing and EPS foam as a shock absorber. Avoid guesswork when trying to find a safe car seat for your baby. Use our expert guide below in order to find the right one the first time. Keep track of your child’s height and weight along with age in order to determine the best seat size for him or her. This alongside behavioral or health issues will enable you to find a seat that suits your kids best for now and the future. There are three types of infant car seats you can choose from depending on the baby’s height and weight. While all are safe, one may be more prefereed to your kid than the other, let’s find out. Also known as rear-facing car seats, infant car seats take the traditional approach and have bucket shape to them. These car seats fit babies for the first year of birth and are normally light enough to double as a carrier. While the installation varies on most of these, most infant car seats fit onto your car seat by means of a base. Others click directly without the base. We recommend that all mothers move from an infant seat to a convertible seat once the baby is between nine to eleven months. As a rule of thumb, the head of your baby should be one inch below the top of the seat. You should normally use these as rear-facing seats for the first two years and then switch it around once the kid is ready to face forward. The difference between convertibles seats and infant rear-facing seats is that these don’t require a base to fasten to your car seat and a typically larger. These are obviously unsuitable for new infants because of their size, and they are not very portable. A car seat that is capable of transforming into either of the above and more, the all in one car seat can both be used as a forward or a rear-facing seat. Like convertible seats, all-in-one seats are bulky and often remain in one place. All-in-one seats are favorites among many parents because they can be used from infancy until when your kid’s ready for the seat belt. It’s important to note that some all-in-one car seats are forward facing only so be sure to find one that is capable of facing both sides if it’s something your particularly looking for. The anti-rebound bar is a bar found at the bottom of the car seat and fits against the seat’s back. The ARB’s purpose is to hold the car seat in place to prevent any violent movement that is caused by the automobiles motion. A very important feature for baby seats, unfortunately, it is only found in rear-facing car seats. All infant cars seats manufactured after 2002 come preloaded with the latch car seat. The latch car seat also helps the baby seat maintain a fixed position despite the vehicle’s movement. They serve to connect the infants’ seat to the vehicle’s seat by means of tether anchors on the side and the top of the seat. Push button latch connectors double as a convenience and a safety feature. This feature allows for easy release of the connectors by the push of a button in order to detach the car seat. In case of an emergency, this will easily allow you to remove the whole car seat or transfer it with ease. The load leg infant car seat includes a ‘load leg’ feature that exists in between the car seat and the vehicle floor. Acting as a ‘leg,’ the load leg is a safety feature that adds an additional layer of stability in the event of a crash. It does this by minimizing energy transfer from the vehicle’s seat to the infant. In extreme cases where the car gets deformed the load leg car seat also helps to keep the infant seat in the car. Though difficult to find in the US car seats, the rigid latch is a key safety feature that places the car seat strapped to the car seat by means of a steel frame. Unlike the latch connector’s above that connect via straps, a rigid latch provides a bit more immovability that is important in a moving vehicle. Fitted on the back seat of the car seat, the Linear Side Impact Protection feature helps in protecting the child from any side collision impacts. By absorbing the force of impact, the Side Impact Protection helps in keeping the baby safe from both accidental and unforeseen collisions. Aside from the above key safety features, there are two more that you will have to be on the lookout for since the baby’s well-being is a priority. One of these is the seat belt lock offs, which normally clamp or pinch the seat belt in order to lock your car seat in case of an emergency stop. Finally, yet importantly, the no threaded harness helps in adjusting the infant seat without readjusting the straps manually. Just in line with knowing your baby, you should also know the size and weight limits of infant car seats. Most car seats are marketed as suitable for babies up to 40 lbs., 32 inches. Do you need all that extra weight? Sadly, no. According to CDC data, your baby is highly likely to exceed that height limit before reaching that weight advertised. We strongly advise that you ignore the size and weight capacities; they should not be a key feature in swaying your purchasing decision. Buying the first car seat for your baby can be just as overwhelming as the idea of having your first baby. When you sit down and narrow down your options in a logical fashion, it doesn’t have to be. As much as parent and babies will differ in preferences, a few things hold firm when it comes to infant car seats. The anti-rebound bar (ARB), LATCH connection, side impact protection, and crash test compliance are essentials for any mother. The five above are the best infant car seats from Graco and are all solid choices. If at all you veer away from our top five, the buyer’s guide should still help you land the right one for your baby’s safety. If you think there is a top Graco car seat that we missed, do share with us in the comments section below! We would like to hear your personal experiences with any of the above as well.